India Law Legal Database- India and Law, Online Legal & Business Policy Database. Legal Research in India- Online Legal Research for India Laws. The Only Legal Publishing House include Case Laws, Judgments, Statutes, Notifications, Circulars, Notices, Reports, Digests, Acts, Bills, Rules, Ordinances, Press Notes, Treaties, Forms, Law Articles, Legal News, Press Releases, State Laws, Industry Laws, Arbitration, Banking Laws, Company Laws, Consumer Protection, Criminal Laws, Employment Laws, Human Rights, Income Tax, Indirect Tax, Intellectual Properties, Sales Tax, SC Judgments, Trade Laws, Student Laws, Education Laws, Law Newsletters, Court Laws, Civil Laws, FAQs, Exims, Policies, Banking, Constitutions, Corporate Laws, Customs, Law Orders, SC Cases, Securities Laws, Telecom, Commentary, Guidelines, Regulations, Schemes, DTAA, Legal Agreements, Circulars, Judicial Interventions, Jurisdictions, SEBI, Legal Documents, Notices, CLB, TRAI Notifications, CIT, DCIT, Legal Amendments, Free Judgments, Legal Appeals, Law Databases, Online Law Databases, Legal Researches, Legal News, Legal Technologies, Law Counsels, Labour Laws, Legal Networks, Law Networks, Law Careers, Legal Careers, Commercial Laws, Legal Professionals, Legal Services, India Codes, Bareacts, Legal Analysis, Indian Laws, International Laws, Cyberspace Laws, Indian Courts, Supreme Court of India, Caselaws, Law Portals, Legal portals, Law and Justice, India Corporate Laws, India Property Laws, Company Laws, Bombay Bar Association, Supreme Court Cases, Labor Laws, National Laws, Law Finders, Companies Act, Law Journals, National Legal News, Regional Legal News, Minority Laws, IP Laws, Law Firms, Petitions, Discussions, Rights, Government, Govt, Collections, Contempt, Code of Conduct on all Subjects, Modules. 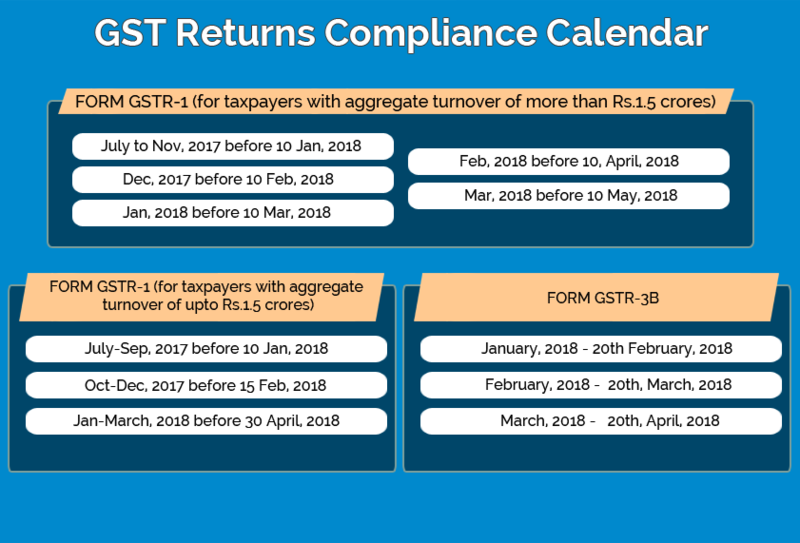 Legal Databases of Andhra pradesh, arunachal pradesh, assam, bihar, chandigarh, chhattisgarh, delhi, goa, Gujarat, haryana, himachal pradesh, jammu and Kashmir, jharkhand, Karnataka, kerala, Madhya pradesh, maharastra, manipur, meghalaya, nagaland, orissa, pondicherry, Punjab, rajasthan, sikkim, tamil nadu, tripura, uttar pradesh, uttaranchal, west Bengal, guahati, Bombay, Chennai, Hyderabad, Guwahati, Madras, Pune, Jodhpur, Jaipur, Ahmedabad, Bangalore, Chandigarh, Bhopal, MP, Aurangabad, Calcutta, Nainital. Resource for Law in India, Constitutional Law, Law society, Federal Law. Get Lega, Law Help. Log on to WEB APP or download the App to access Manupatra on your phone. Complimentary with your online subscription. Host of Free Apps from Manupatra : Notification Updates, IPC, CPC, CrPC, Indian Bare Acts, Supreme Court Judgments. Manupatra E-Books on iBook Store and Kindle. 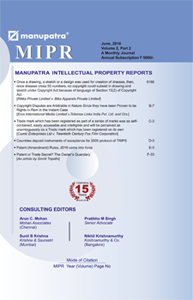 MIPR is a comprehensive resource for IPR information, news and views from India and across the globe. 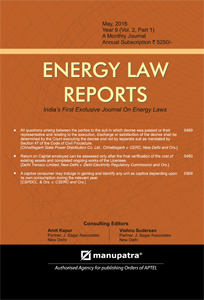 It covers articles from eminent jurists, Lawyers & academicians on new IP developments in India , US, UK, European union & various other jurisdictions. 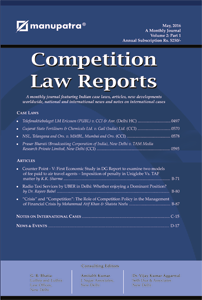 Notes on International cases & judgments from the Indian courts are also covered. If you wish to receive legal and manupatra updates through WhatsApp, please submit the following details. * Please add our number 9717733518 and 8448015217 to your contact list, this will help to ensure that you receive all our broadcasted messages. You will not be able to receive the broadcasted messages if our number is not added to your contact list (Address book). Receive Legal news updates from Manupatra on your device. This service is Free and available to all Manupatra subscribers and non subscribers. You don’t have to login to the App to read the updates. Simply install the App and start receiving the updates. To access Archives of the updates, subscribe to Manu App. The case laws in Manupatra are divided into fields. 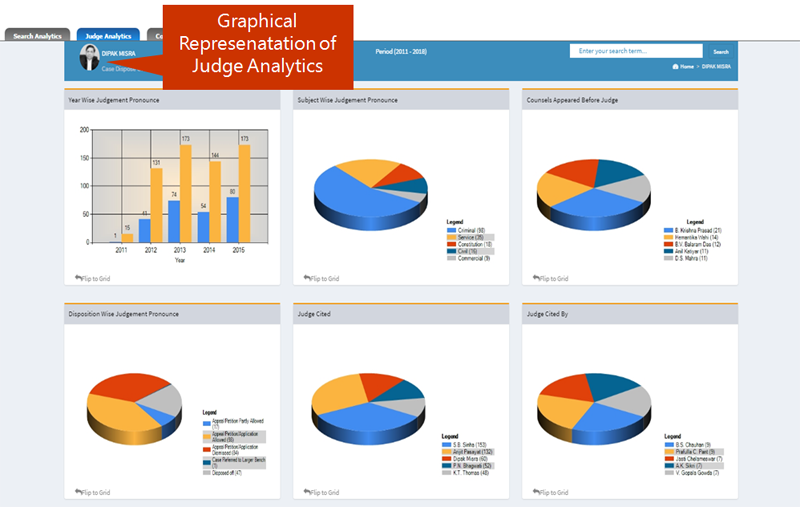 Each field contains a specific information (e.g., appellant/respondent name, judges name, equivalent citation, subject, judge name, citation, acts, rules, order etc). 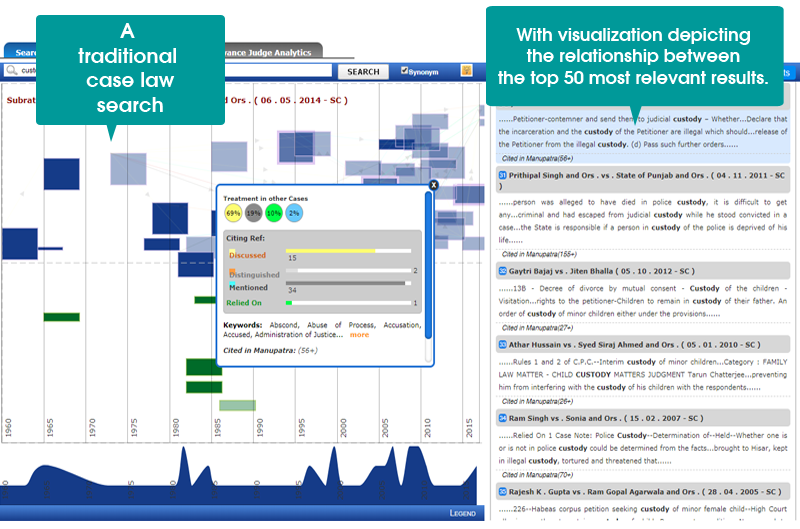 Legal search allows you to search on a specific field or a combination of fields. This interface gives you the single search box experience and assists you to search for key words, phrases, multiple phrases and more. You can perform Boolean search using Manu Search. Simply type in your query and the search engine uses back end algorithms to give results based on relevancy. The results can be sorted on Decision Date; Title; Court Name and Relevance. 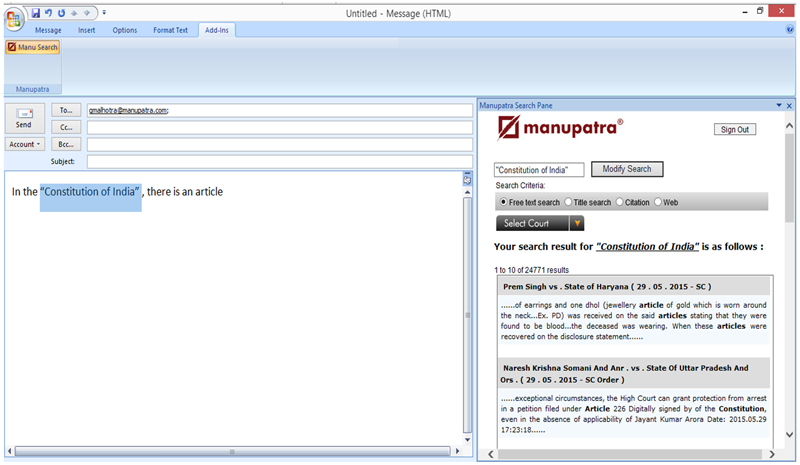 Manupatra has a powerful and exhaustive Citation search. While specifying all components of the citation, gets you unique result, inputting partial information of a citation also gets you results, which helps you identify the relevant document. 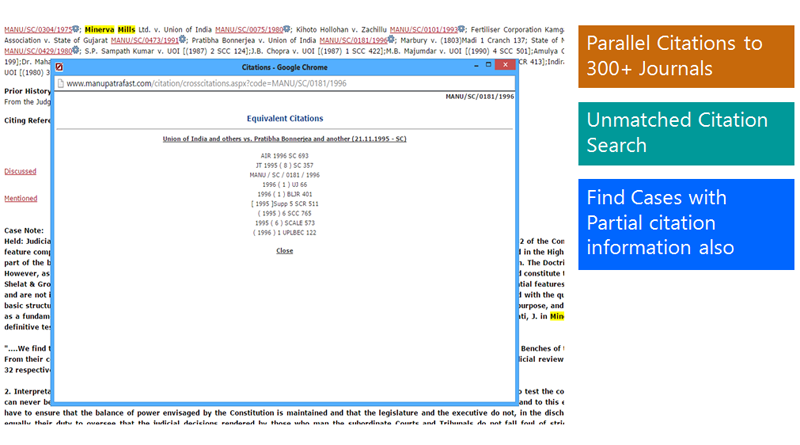 Click on Legal Search to access Citation Search. 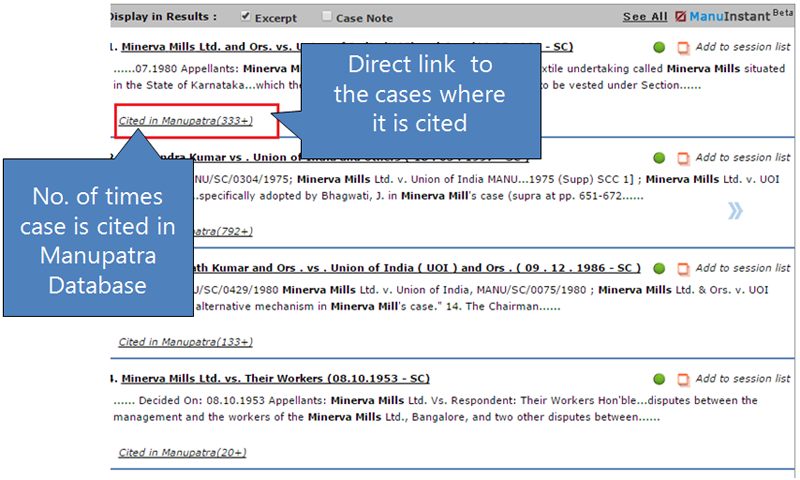 Select International citation to search for cases from US, UK, Srilanka, Bangladesh and Pakistan. 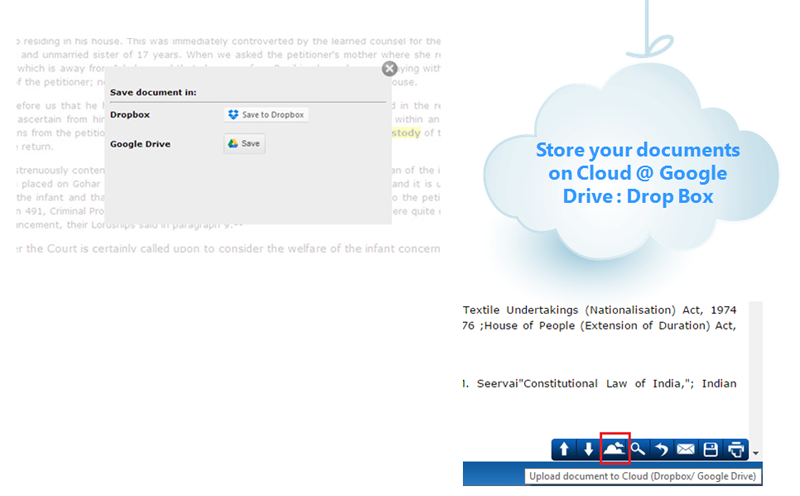 Typing at least 3 characters of the Act name drop down will list the related acts, making the selection easier for you. You may either search for query terms or select one of the options of Annex, Annexure, Appendix, Chapter, Order, Part, Schedule, Section. Select the Search by Act No. radio button. Clicking on the result displays the Index of the Act. 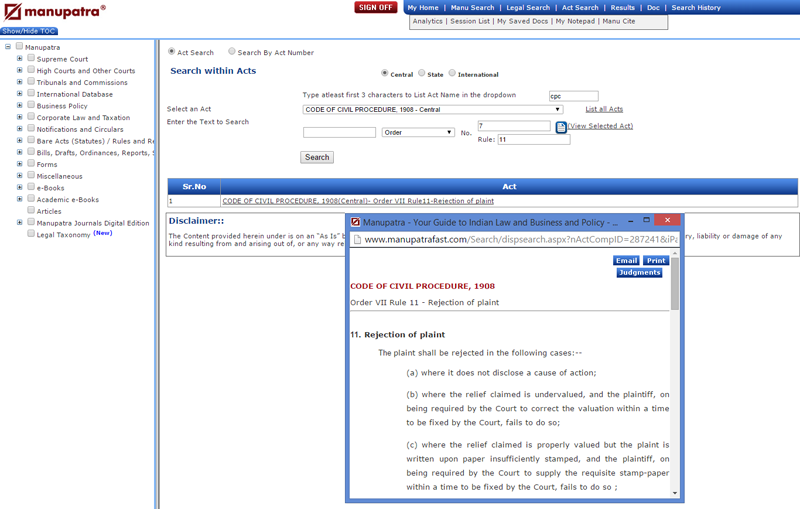 In the Act Search the user has an option to search Order & Rule in combination as well. e.g. CPC order 7 Rule 11. Type 3 characters of the Act CPC, Code of Civil Procedure. Select the Act name from the drop down menu. In the provision select Order No. 7, a rule box will appear next to the text Box, enter rule no in that & click on search. 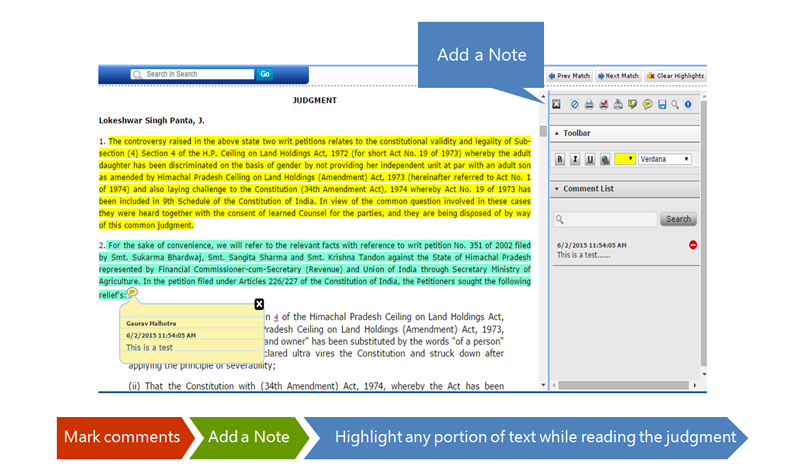 Filters Filters on manupatra give you the ability to quickly focus on the documents that are most important to you. 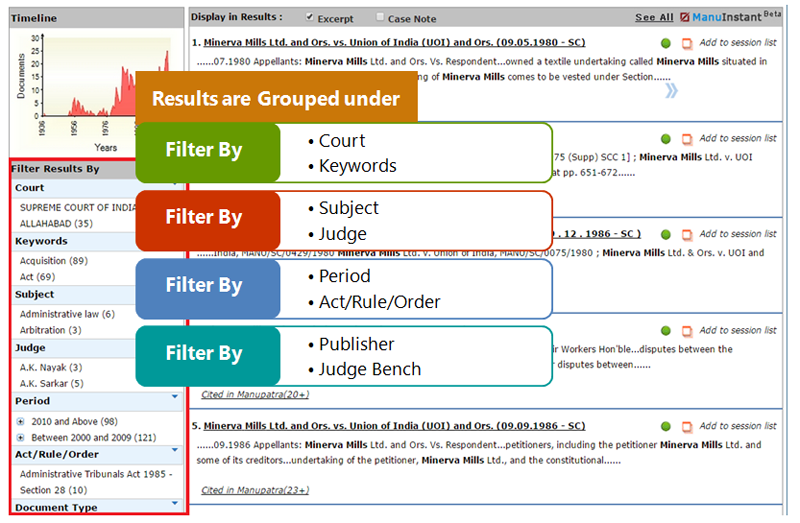 Using filters, you can narrow a search result list by jurisdiction key words, judges name, acts referred etc. When you run a search query, the results are automatically clustered under various heads such as Court, Document Type, Subject, Judge, Ministry, Period etc. making navigation easy for the user. 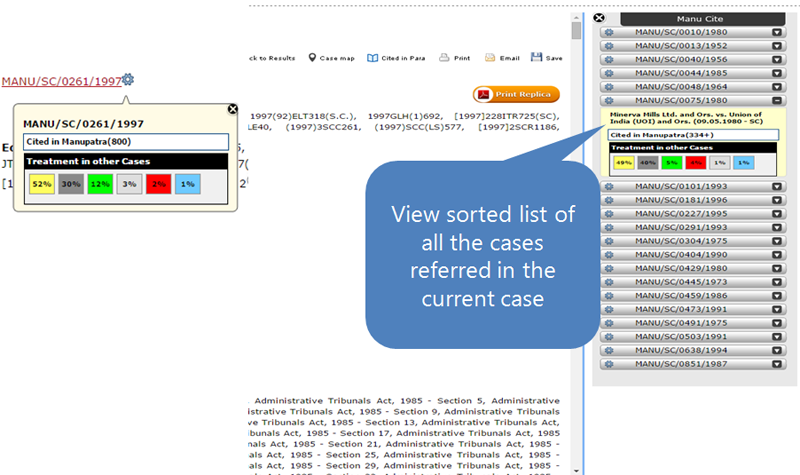 You can Sort and re-sort results on Relevance, decision date, title of case and court name. 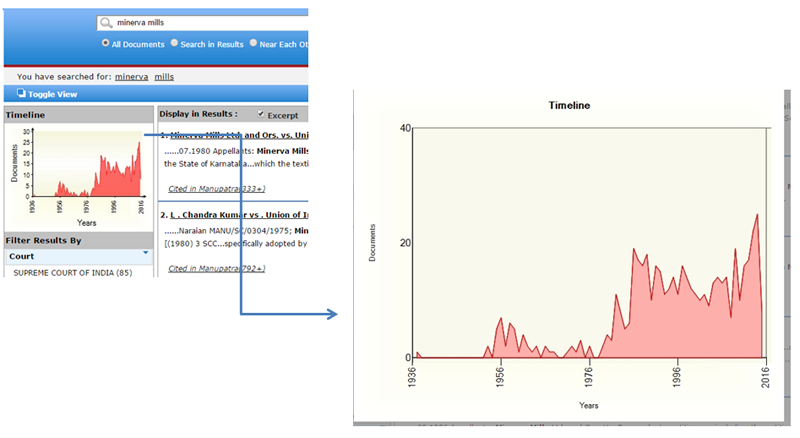 Timeline Graph gives a pictorial depiction of the results, giving a quick preview of how the search results are spread across various years . 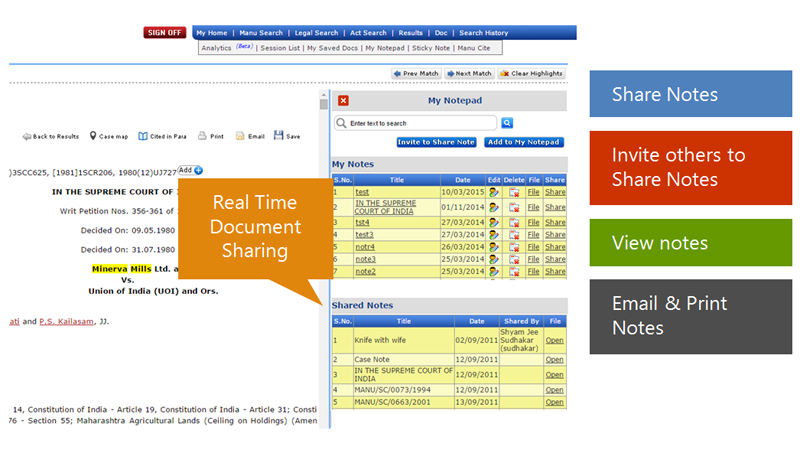 Toggle view provides for viewing hit list and document in same pane, thus making browsing easier and faster. 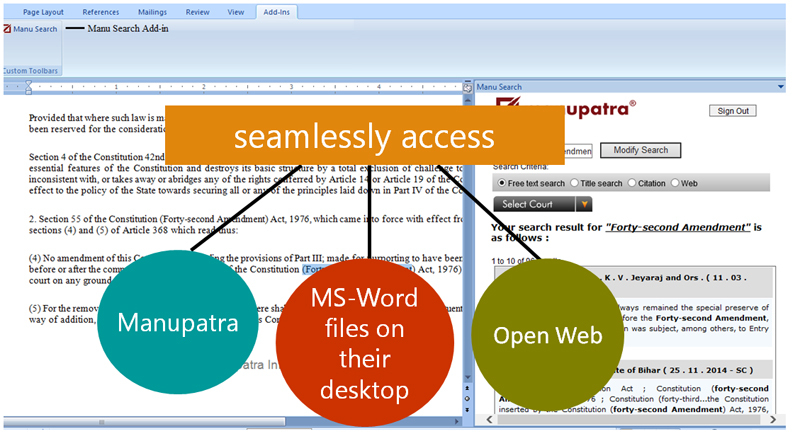 View document in new window allows ease in browsing by allowing you to open documents in different windows. Save Search allows you to save your searches for future reference. You can give the search result a name by which you may recognize the search at a future date. 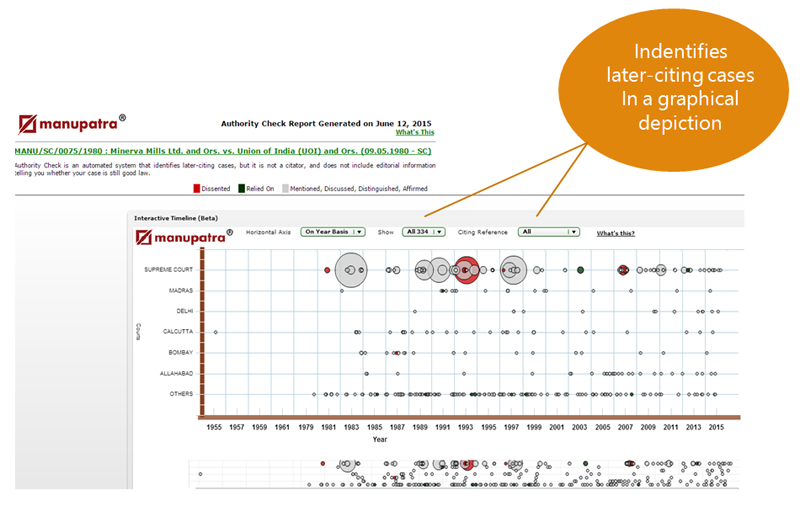 Authority Check provides for an interactive timeline which identifies later-citing cases. It makes it easy to pick out the best cases from a large collection of results by displaying cases in an intuitive graphical format. Vertical Axis displays list of Courts and the Horizontal Axis displays year range in which case has been further cited. By rolling and holding mouse over a bubble, one can view extract of the case and no. of times it has been cited in future. Only database providing extensive cross referencing which saves time for the users. 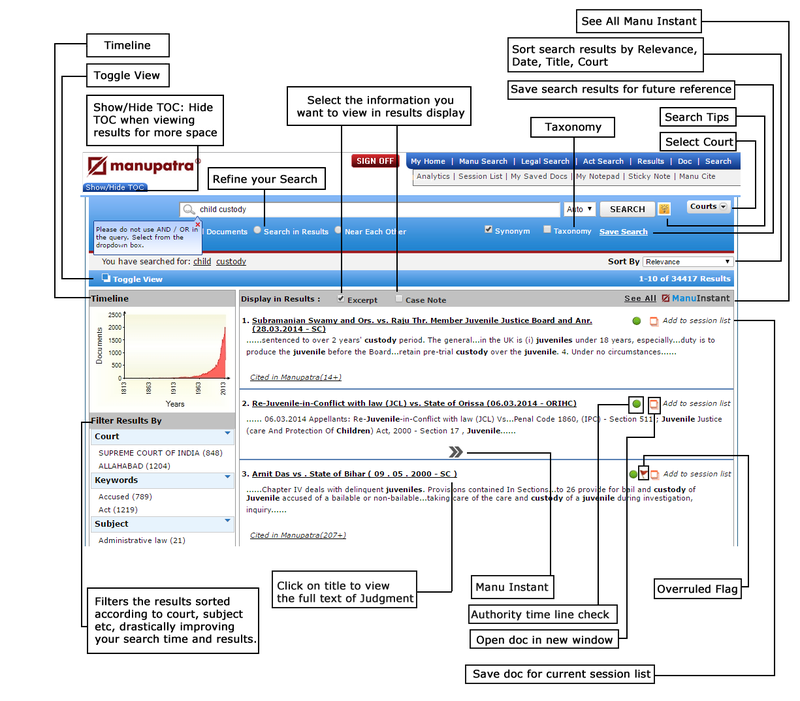 Manupatra Taxonomy is a hierarchical structure which lists the topics and the sub topics under that. The aim is that each topic covered, broadly reflects the terms associated with it as a user might expect to find it in major textbooks. It will aid the user in choosing keywords consistently and appropriately. The structure is created by identifying basic concepts and topics. These concepts and topics do not necessarily represent a complete subject area but define groupings of terms with similar characteristics. It is like a map which will help a user locate what they are looking for. 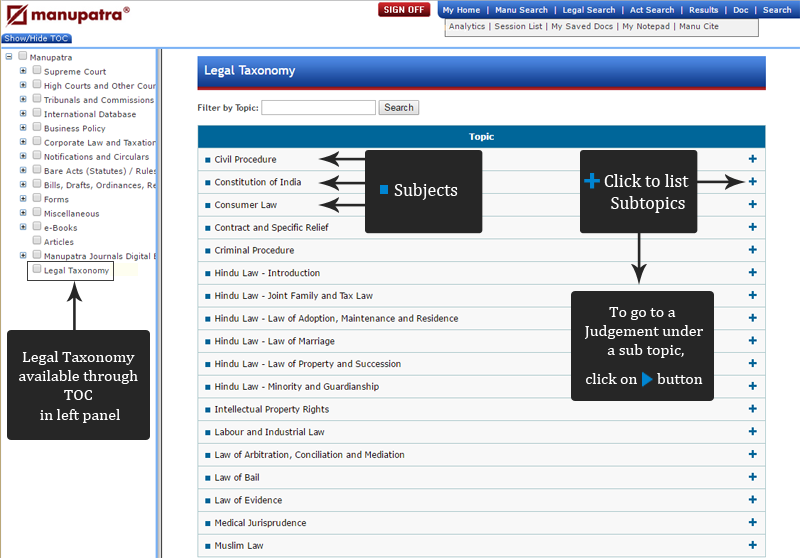 On click of +button it will list the Sub Topics, to directly go to the judgments under a Sub Topic click on >button. Judgments appearing under each sub topic is not an exhaustive list on the topic. These are considered important by our editors. 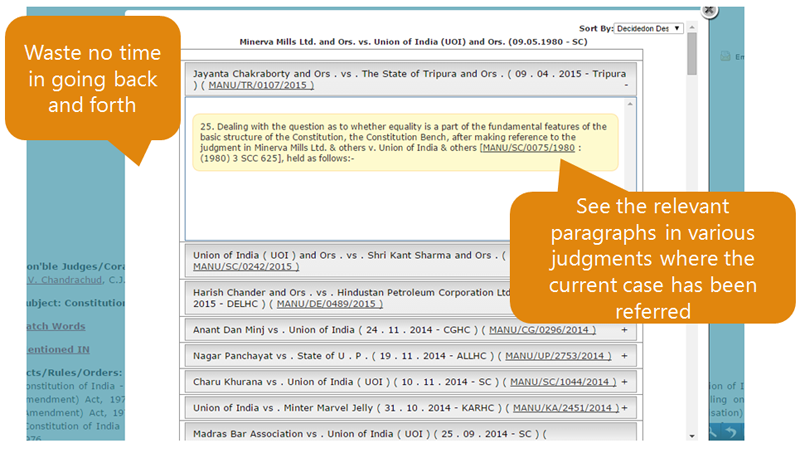 To look for more judgments click on Cited in Manu. 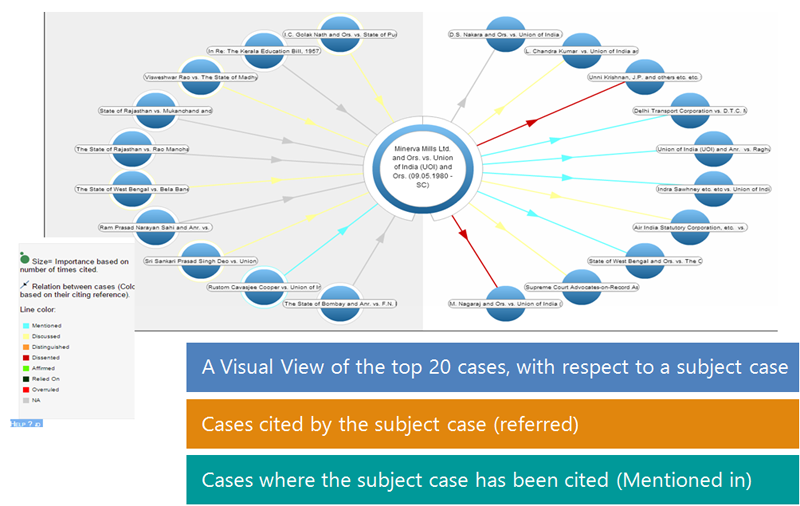 This will give you list of judgments where the subject judgment has been cited in, to help you identify similar cases. Adobe Acrobat Reader(For Print PDF) to read it without downloading. Manupatra Site uses POP UPS. You will not be able to view these if Pop Up’s if you disabled Pop Ups in your browser window. You will find the button for enabling the pop up’s in the top bar of your browser. Manupatra usesCOOKIES. Please be sure to have cookies enabled.